Priced for the budget conscious and easy reach of major western suburbs Hospitals so that you can afford to be near loved ones. 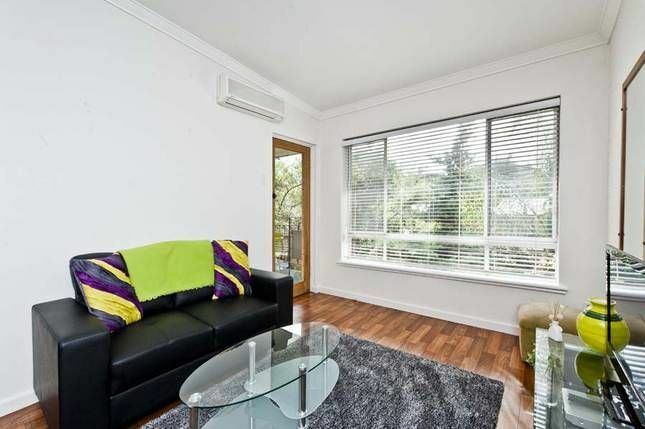 Situated in the best presented complex in the street, this beautiful one bedroom Perth holiday rental is perfect for a couples getaway! The complex features lush green gardens, and there is a communal barbecue on site. For those who have a car, parking is available at the rear of the complex. This Perth holiday apartment is smartly renovated with a spacious kitchen featuring dishwasher, gas hotplate, and convection microwave. You are able to cook your own meals with generous cupboard space and an ample preparation area. The cosy dining and lounge area will suit the self caterer, while the comfy bedroom features an en suite bathroom which includes a washing machine. Grab a cold drink and take in the sun on the lovely North facing balcony which is a real feature of this Perth holiday property. Thank you Nicola, I think the Jolimont area with its parks and train station offer terrific value for any visitor to Perth. Thank you for staying with us.